Setting up your Linksys WUSB6100M Max-Stream™ AC600 Wi-Fi Micro USB Adapter is quick and easy. This wireless USB adapter allows you to stream videos, play online games, and surf the internet without lagging or buffering. 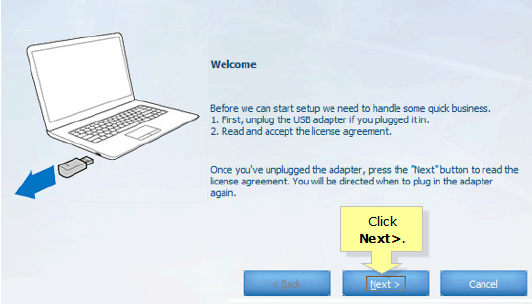 This article will guide you on how to install the drivers of your wireless USB adapter using the Setup Software. NOTE: The wireless USB adapter supports Windows® 7, Windows 8.1 and Windows 10 operating systems only. Windows 8 is NOT supported. Before proceeding, make sure the Linksys WUSB6100M is NOT connected to your computer. Download and run the Setup Software found on the WUSB6100M Downloads page. QUICK TIP: Alternatively, you may also use the Setup Software inside the setup CD that comes with your device. 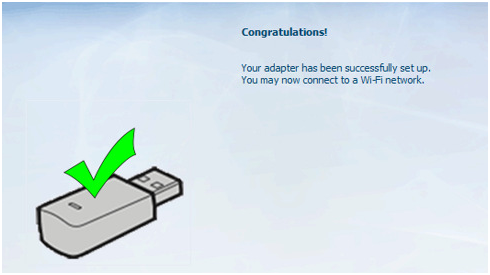 Wait until you are prompted to connect your wireless USB adapter to the computer. NOTE: If you have not connected your wireless USB adapter and the progress bar has been completed, you will receive the Unable to find your adapter! error message. 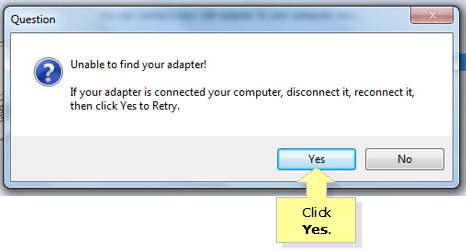 Click the Yes button to try again. Once your wireless USB adapter is detected, it will install the drivers automatically. If your computer has a built-in wireless USB adapter, you need to disable it to prevent any connection issues with your Linksys WUSB6100M. To know how to disable a built-in wireless USB adapter, click here. You may now connect to your Wi-Fi. For instructions, click here. IMPORTANT: If you encounter Error Code 52 on your Windows 7 operating system, you need to run the Windows Update first then install the wireless USB adapter. For more information about this error, go to the Microsoft® Support site.